A new publication from EcoSanRes, published by IWA. The report is a product arising from the work of the Sustainable Sanitation Alliance which was initiated prior to the International Year of Sanitation in 2008 in an attempt to inject sustainable development ideas into the sanitation sector. It functions as a vision document for those policymakers, researchers and practitioners that are striving towards fundamental reform and improvements within the sanitation sector in both rural and urban populations in all countries of the world. 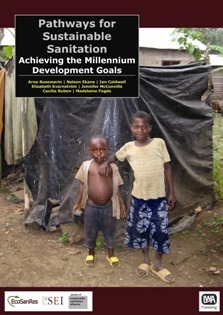 It reviews the global progress being made towards achieving the Millennium Development Goal (MDG) target on sanitation. A literature review is presented on sanitation provision including human health impacts and the estimated costs and benefits of achieving the MDG target. The report also provides a critique in that the UN has not yet introduced the concept of sustainability into the MDG programme in general and in particular into the sanitation sector which is highly dysfunctional and suffering from limited political leadership at both the local and global levels. It introduces the various sustainable sanitation options available and what approaches can be taken to improve sanitation systems - not just toilets which are only a small part of the overall system of food, nutrients and water cycles. The study estimates the numbers of urban and rural households, including slum populations that are being targeted in all world regions. It also evaluates the historic trends in morbidity and mortality linked to diarrhoea arising from lack of functioning sanitation services comparing these to the UN data on sanitation coverage. The report estimates the potential fertiliser replacement capacity that reuse of human excreta can have for all world regions. Finally it provides a vision for future development within the sector where more sustainable options like source separation and reuse are promoted giving positive environmental or "green" impacts but also catalysing greater involvement and understanding on the part of individuals in society.